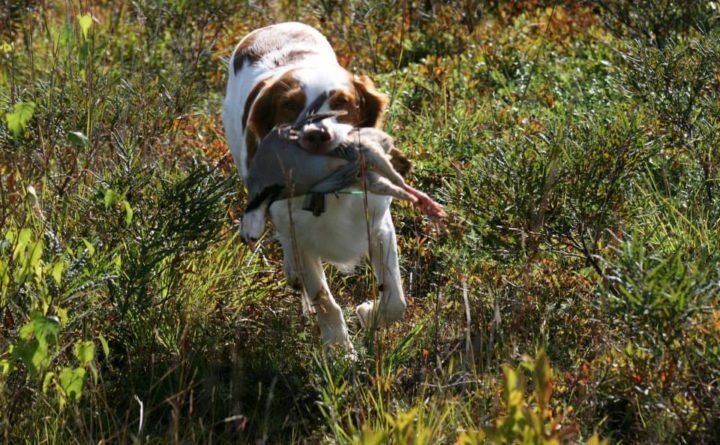 Bullet, a Brittany dog co-owned by Julie Harris of Hermon and John Short Sr. of Acton, retrieves a dead chukar partridge in March 2016.This bird often is used in training and hunting competitions. I’ve had various training issues with my bird hunting dogs — mostly due to my own ineptitude — but there are dogs that balk at certain elements of training. As with most lifelong skills, the rules of the hunt are taught in pieces. I think the single most important skill is to respond immediately to voice and whistle commands. A quick response could keep the dogs away from a skunk or porcupine, a busy road and other real or perceived dangers. The dogs learn to “quarter,” which is a kind of sweeping pattern back and forth in front of the hunter, as they seek bird scent. They learn to stand steady or “whoa” when they find a bird, pointing their nose, body and head in the bird’s direction, and staying there until the hunter flushes out the bird and shoots it. Then the dogs learn to fetch the dead bird from wherever it has fallen — water, woods or field — and retrieve it to the hunter’s hand. Put it all together, and we have an awesome bird dog. My Brittany dog Bullet was pretty much a natural at most aspects of the hunt. I always felt like I was just reinforcing what he innately knew, right from the first day of yard work with him. He took constructive criticism of his performance well as fine-tuning corrections were made to his range for seeking birds, pointing position relative to birds, response to whistle and voice commands, pointing style and honoring other dogs’ points. Except when it came to the retrieve. He has stubbornly challenged that expectation, even though with lots of patient training on the part of his co-owner/breeder John Short Sr., Bullet learned to go into water, do blind retrieves — where he has to find the bird all over again if he doesn’t see it fall after it’s shot — and to respond to the fetch command. 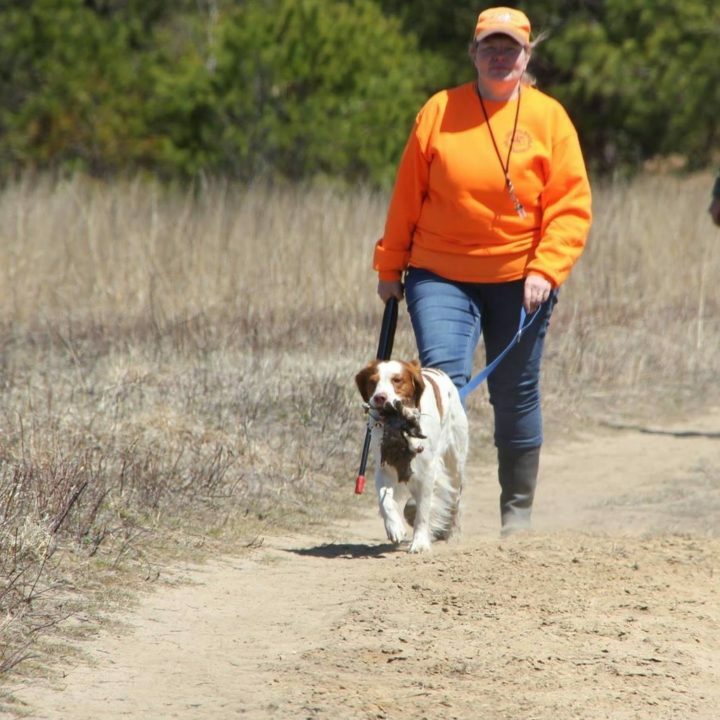 Julie Harris of Hermon and her Brittany dog Bullet return to base after competing at senior level in a hunt test held by Central Maine Brittany Club at Kennebunk plains in April 2016. Bullet is co-owned by Harris and John Short Sr. of Acton. But we’ve had mixed success getting a consistent retrieve out of him. Sometimes he will bring the bird all the way back. Other times, he will pick up the bird and bring it part way, then drop it. I personally think he doesn’t like having a mouthful of feathers. I can’t blame him for that, I guess. His son Quincy, with a much softer personality in some ways and a different feeling about rules in general, is turning out to be a nice hunting dog when it comes to finding and pointing birds, being steady to wing (when the bird flies out of its hiding spot) and shot, and honoring other points. But the retrieve? This seems to be a topic he and his father agree upon. Quincy thinks bringing anything back to me should be his game with his rules, whether it’s a ball, a toy or a bird. It’s a training issue I created for myself when I did not recognize the development of this tendency soon enough. Lesson learned. Finally this season, he was enthusiastic about being sent to fetch the dead bird. He would sniff it all over, then come back to me as happy as could be — without the bird. Believe it or not, that’s progress. Last season he wouldn’t even leave my side when I tried to send him to fetch a dead bird. There are different methods for teaching the retrieve if the dog doesn’t do it naturally. The best time to teach it is when the dog is a puppy or young dog. While teaching other basic commands, add fetch. Teach it slowly by having the dog on a long line and help him to come back to you with the object in his mouth by encouraging him through little tugs on the cord if he gets distracted. Use different objects, including a bird wing or dead bird. Remember to praise him profusely when he comes back to you. As he gets confident, you can throw the object a little farther and just keep working on it until he is fetching consistently from some distance and bringing the object to your hand. Keep sessions short and fun. — Reinforce holding the bird: Have the dog walk by your side either on lead or by heeling while carrying a bird wing or dead bird in its mouth. Be positive and encourage him to pick it back up if he drops it. Repeat in short sessions until he is comfortable with it. — Forced retrieve: Use negative reinforcement through an ear or toe pinch while forcing the dog’s head to the object you want him to pick up, pinching until he does what you want. — Modern technology: People also use electronic and beeper collars to teach and reinforce the retrieve. These collars have a wide range of sophistication and prices, and it is a good idea to consult with a professional or experienced trainer about their proper use. Despite the inconsistency in Bullet’s retrieve, he has earned a senior hunter title in hunt-testing competitions, and has competed at the master hunter level. Both levels require the dog to retrieve dead birds. And I have not yet given up on Quincy, who has his junior hunter title where no retrieve is required. I have plans for him in senior hunter competitions — if we can nail his retrieve.